Note: You can enter this giveaway two (2) times per e-mail address per day. Deadline is 11:59PM ET 3.1.19. Soup’s on! Or sauce…or stew…or spaghetti. With the Le Creuset 10 Quart Stockpot, your options are almost limitless. Made of heavy-gauge carbon steel that provides even heating, the tall narrow shape quickly heats through layers of food and liquids and ensures it stays hot longer – just what you need when making Portuguese Kale Soup. The porcelain enamel coating is scratch-resistant, impermeable to odors and stains, and also makes for easy clean-up. 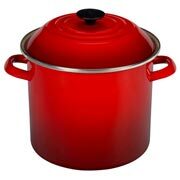 It comes with a matching enameled tight-fitting lid to seal in the heat and flavor of Julia Child’s Coq Au Vin. Best of all, it is able to be used on all heat sources: electric, gas, ceramic, induction and halogen. So let’s get cooking! NO PURCHASE NECESSARY TO ENTER OR WIN. Void where prohibited by law. Open to legal residents of the 50 U.S., D.C. and Canada (excluding Quebec) who are at least eighteen years old at the time of entry and have internet access. Begins on 1.4.19 at 12:00:00 a.m. ET and ends on 3.1.19 at 11:59:59 p.m. ET. To enter the giveaway, submit your full name and email address on this form. Odds of winning this giveaway depend on the total number of eligible entries received. Only two (2) entries per email address per day. Sponsored by Leite’s Culinaria, Inc. For more information, visit our Official Rules. Be sure to add giveaways@leitesculinaria.com to ensure notification if you are the winner.